Update 6/23/18 9:30 AM PT: TanaCon has been cancelled. Overnight, Mongeau attended a security meeting in an attempt “to make sure everything can be safe for tomorrow,” but apparently, no agreement could be reached. In the morning, TanaCon production partner Good Times sent out an email confirming the cancellation of the event one day before it was set to end. VidCon will go on as planned at the Anaheim Convention Center. Running an online video convention is a tricky thing, and Tana Mongeau learned that lesson on June 22. 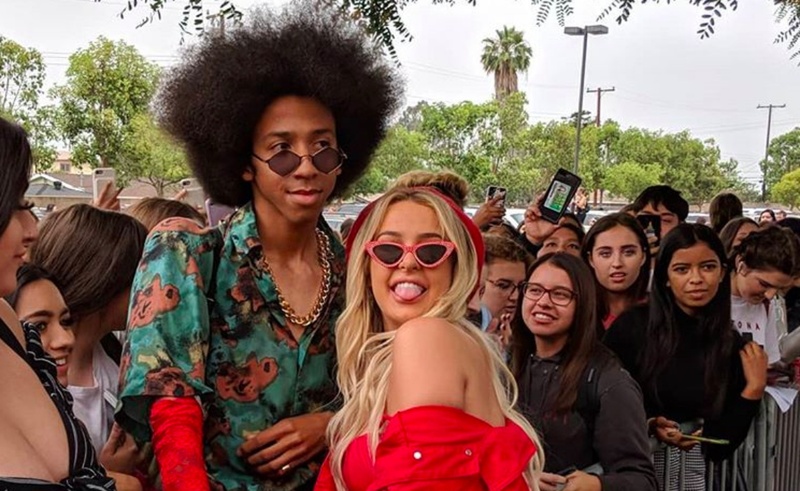 TanaCon, Mongeau’s guerrilla-style, creator-focused event, was forced to find a second venue after thousands of unticketed guests pushed the Anaheim Marriott Suites past its capacity. TanaCon, which Mongeau launched after having a negative experience at VidCon in 2016 and 2017, was announced earlier this year and organized in a matter of months. With help from management company Good Times Entertainment, Mongeau recruited dozens of top YouTube stars to appear at her event and booked a venue adjacent to VidCon, which takes place each year at the Anaheim Convention Center. Between an initial batch of free tickets and a tier of $65 VIP passes, Mongeau and co. said they sold about 5,000 tickets to TanaCon. At first, Mongeau and her TanaCon attendees seemed chipper, as the picture above shows. But as you might expect from an event organized in months and opened up to the masses, issues soon began to arise. According to Mongeau, 15,000 unticketed guests joined the TanaCon queue, with some attendees waiting six hours in the intense Anaheim sun just to enter the Marriott. Security was reportedly patchy, and VIP passes ultimately conferred few of the benefits that were promised. Once TanaCon guests got inside, they found little entertainment and even less space. Ultimately, it was the surge of unexpected attendees that sent the TanaCon team scrambling for a new home. Mongeau said the Marriott’s capacity is 5,000, in line with the event’s initial ticket sales. It should be noted that the listed capacity of all the event spaces at the Marriott Anaheim Suites only adds up to 3,198. After a run-in with the fire marshal, Mongeau opted to bring her event to a “new venue,” where the second day of TanaCon is expected to go down on the 23rd. While Mongeau hasn’t yet announced what that venue will be, it is expected to split Saturday’s TanaCon programming with the Marriott. But the damage is done. If anyone expected a convention hosted by a YouTube star known for her connections to YouTube drama to go off without a hitch, they certainly don’t think that anymore. If anything, TanaCon’s trials are a testament to the skillful organization of VidCon, which in its ninth year seems to be operating very smoothly. We’ll update this post as we learn more about Mongeau’s plan for the future of her event.